Available as low as $5.79 per coin over spot! The first human beings to set foot on the moon may have been American astronauts, but this was an accomplishment to be celebrated by all of mankind. As Buzz Aldrin and Neil Armstrong walked the surface of another celestial body for the first time, the words “We Come in Peace for All Mankind” were uttered. 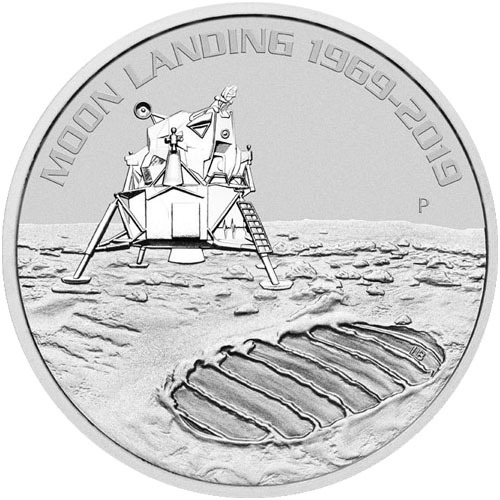 2019 marks the 50th anniversary of that accomplishment and is celebrated by various nations with gold and silver coins, including these 2019 1 oz Silver Australian Anniversary of the Moon Landing Coins available at Silver.com. Coins ship to you inside of individual protective plastic capsules! Issued to mark the 50th anniversary of Apollo 11 landing on the moon! Issued a face value of $1 (AUD) by Australia. Eagle lunar lander and footprints on the reverse. The Apollo 11 mission lifted off from Merritt Island, Florida, on July 16, 1969. After a four day trek into outer space, the three-man crew of Michael Collins, Buzz Aldrin, and Neil Armstrong approached the lunar surface on July 20, 1969. Collins remained behind the command module as lunar lander pilot Buzz Aldrin and mission commander Neil Armstrong descended to the moon’s surface. Although the moment is remembered as America’s crowning achievement in the Space Race, it was an international effort in some ways. It said that some 600 million people around the globe were able to watch this monumental occasion live on television as it happened. Australia’s SCIRO Parkes radio telescope helped transmit the signal to Australians and NASA’s Honeysuckle Creek tracking station near Canberra assisted in the success of the flight to the moon. On the reverse of 2019 1 oz Silver Australian Anniversary of the Moon Landing Coins is the image of the Eagle lunar lander resting on the surface of the moon. The only disruption in the pristine surface of the moon in this image is the footprint left behind by the flight suit worn by Aldrin and Armstrong. 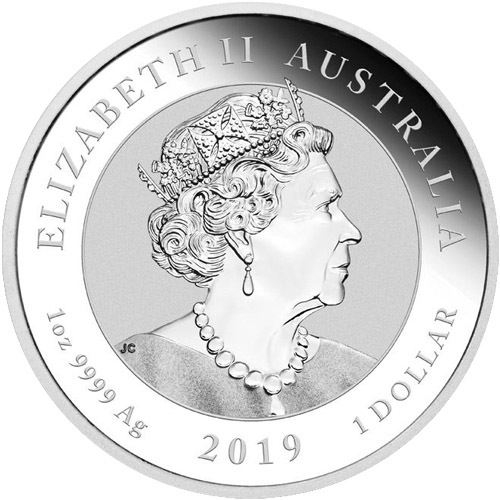 The obverse of 2019 Silver Australian Anniversary of the Moon Landing Coins features the right-profile portrait of Queen Elizabeth II. Her Majesty is depicted here in the sixth design to feature on Australian coins since her reign began in 1953. The Queen’s portrait here is the first since the 1960s on Australian coins to include her neckline and shoulders, and is based on Jody Clark’s fifth-generation design for the Royal Mint of England. We encourage Silver.com customers to call us with questions at 888-989-7223 when buying silver. You can also reach out to us online through our live chat and email address options.